Time for another stroll down Memory Lane (via Iceland). THEN: Spurs boss Terry Venables splashed out Â£100,000 on a 23-year-old Bergsson in 1988. 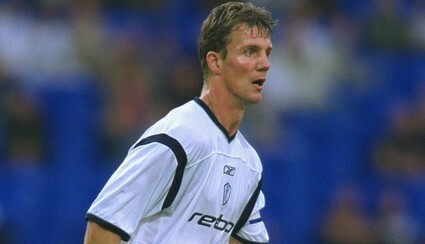 The Icelandic centre-back was used as a squad player at White Hart Lane, making just over 70 appearances in six years. New Spurs boss Ossie Ardiles told Bergsson to find a new club in 1995. Bolton manager Bruce Rioch saw the Icelandic international play a trial game for Crystal Palace and quickly made a move. Bergsson and Bolton was a match made in heaven. His first touch for the club was an assist in the League Cup final. He was a consistent performer in Bolton’s yo-yo teams of the late 1990s. Sam Allardyce was a big Bergsson fan and twice persuaded the centre-back to postpone his retirement. NOW: Despite a third attempt from Sam Allardyce to prolong Bergsson’s career (which including getting him drunk and presenting him with a new contract) the Icelander hung up his boots in 2003. While in limbo at Spurs, he had begun studying to be a lawyer. Upon retiring he completed his studies and moved into the legal profession in his homeland. He also hosts a football talk show on Icelandic TV.